December 10th is officially recognized throughout the world as Human Rights Day, today celebrating the 70th Anniversary of the Universal Declaration of Human Rights established in 1948. Human rights is a topic that is front and center as we read the news and face shared realities around the world. Did we walk forward, reverse, or stand still? The Universal Declaration of Human Rights was the result of having experienced the atrocities of the Second World War and vowing to never again have this happen. Haiti was a founding member of the United Nations on October 24, 1945 with Senator Emile Saint-Lot, a founding father of Le Flambeau Foundation, playing a key role as the founding and first UN Ambassador for Haiti. 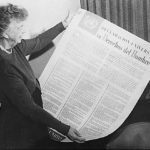 World leaders decided to complement the UN Charter with The Universal Declaration of Human Rights aimed at guaranteeing the rights of every individual everywhere. Senator Emile Saint-Lôt from Haiti was a co-signatory who, along with U.S. First Lady Eleanor Roosevelt, and many other countries, adopted the Universal Declaration of Human Rights on December 10, 1948. Senator Emile Saint-Lot is a founding father of Le Flambeau Foundation. To read the Universal Declaration of Human Rights, see the following links – (in English) (French) (in Kreyol). .Discussions past and present have taken place on this topic. Following are highlights. Declaration of Human Rights (by Dr. Luc L. Colas, December 10, 1998 – Cap-Haitien, Haiti) Dr. Colas is the inspiration that served as a founding spirit for Le Flambeau Foundation. This article was written prior to the existance of the foundation. Fifty years, (December 10, 1948), Palais Chaillot, Paris), after this famous Declaration of Human Rights, following the Senator Emile Saint-Lôt, which… The powerful verb still echoes to our ears, and we are wondering, and we are searching, our way along, in our darkness, this universality–and we have doubts. What else can we do, when terrified and stunned, we see Read more . Youth Discussions: (youth in Haiti) Following are contributions made by youth in Haiti in a recent fall 2018 discussion and several that took place in 2013 and 2014, on this topic. They addressed the following questions: What does the Universal Declaration of Human Rights mean to you today? How do you feel that the world has been impacted by the Universal Declaration of Human Rights? With this in mind, what is your vision moving forward? How will it, or can it, impact Haiti? Haiti is a founding and permanent member of the United Nations and Sénateur Emile Saint-Lôt served as the first U.N. Ambassadeur for Haiti and as a member of the Security Council, responsible for voting on the independence of countries. Ambassadeur Emile Saint-Lôt later cast the deciding vote for the independence of Israel, Libya and Somalia; and wrote the constitution for many more. To learn more click here. Education is a universal human right. Let us support our youth in Haiti and move forward. You met our scholars, connected with our programming and exceptional commitment, were with us at our 10th Anniversary Awards Celebration, and more. Join us as we take next steps to increase capacity and benefit more students in Haiti with access to education; and ultimately jobs – in Haiti. We invite you to make a tax-deductible donation now (click here).